Bump keys are a major security threat to nearly every family in American as shown in this ABC News Report;https://supergriplock.com/abc-news-report-on-bump-keys/. . The International Association of Police Chiefs fighting crime since 1893 understands the problem and they introduced Super Grip Lock to law enforcement in the Police Chief Magazine. However, the general public is still uninformed that bump keys allow anyone to open locked doors as shown by the ABC news reporter. If you rent or stay in a hotel or motel you have another problem: Staff, housekeeping and maintenance all have access to keys or cards that also open guests locked doors. The inventor a 70 year old grandmother Melinda Moore of Sweet Home, Oregon knew if she held the deadbolt handle in the locked position that no one could unlock her door. 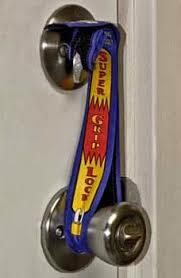 Then she invented Super Grip Lock to do that job for her.Now families can be sure their deadbolt will stay locked at or when traveling using her invention. A. See how and why Super Grip Lock works..
B. Watch the Super Grip Lock testimony of Police Lt. Bryon23 year veteran. D. See how Super Grip Lock works for travelers in theTravel Video. E. See the accolades from the lock industry, law enforcement, marketers and our customers. Instructions are printed on the Product. No Tools needed to make it work.